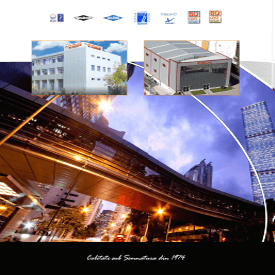 ANALKO Company began its course in the aluminium sector in 1974, its main field of activity was anodizing. Today Analko Aluminium Industry offers a wide range of products and services. ANALKO is the leading company dealing exclusively with the Electrostatic paint and anodizing in the Balkans and due to this, we are obligated to provide knowledge and quality services in each professional area. After 40 years of continuous development, our company has all the quality certificates (ISO 9001, QUALICOAT, SEASIDE CLASS, and QUALIDECO). Since we always use approved first materials and thoroughly quality control at each production stage by the quality department of the company in order to minimize the chance of error we have the ability to guarantee all kinds of paints. The major aluminum manufacturing companies trust ANALKOs Quality. With 9 modern manufacturing lines with two Electrostatic units in Greece and Romania and one anodizing unit, our company can meet any requirements. Ask any information about the colors, their strengths and their characteristics. We believe that the paint its an important parameter for the quality of the finished product and must be certified by specialized units such as ANALKO. Our colour catalogues are available. - Series PRISMA with metallic paints mainly in imaginary colors that meet every requirement. – Series EMFASI very beautiful colors the particular texture gives them even more (emphasis) in the final result. – Series ANAGENNISI plain reduced gloss shades that offer unfussy luxury, with further precaution from sunlight. You can find more information at www.analkoaluminium.ro/en. Sublimation (Wood Finishes) – WOODinAL is a technology which allows the production of high quality permanent simulated wood coatings on any aluminium profile and on all types of casings. We can produce any wood texture and colour and can also transfer with precision marble and granite shades on painted aluminium surfaces for a long lasting effect. The range of colour options is being expanded continuously to offer new possibilities for aluminium architectural applications. Semi production of metallic roll shutters, sectional doors and garage roll type doors, high speed doors, barriers, mosquito nets – you can find more info on www.analkodoors.ro/en. Supply of finished products – fire resistant doors, fire resistant glazed doorsdesigned to isolate rooms inside residential, industrial or office buildings from fire – you can find more info on www.analkodoors.ro/en. Our Company works with the most important world-wide suppliers of aluminium and steel profiles such as: ALUKONIGSTAHL (SCHÜCO), WICONA, REYNAERS, SAPA (ALCOA), ALUPROF(METALPLAST BIELSCO), VIMETCO and also all the Greek suppliers: ALUMIL, BALKAN, EXALCO, ETEM, DORAL, etc. The vast majority of Romanian construction projects since 2004 were painted by ANALKO. Some of the most important of these projects, completed together with our partners are: PALATUL DE JUSTIȚIE, GRĂDINA BOTANICĂ, NORTH GATE, CITY GATE, FLOREASCA OFFICE, PROMENADA MALL, NOVOTEL, S PARC, CASA NOTARILOR, NOVO PARK, AVERESCU, AUTO ITALIA, as well as the vast majority of malls built in Romania: COTROCENI MALL, SAN PLAZA, GRAND ARENA and many others like BUCHAREST TOWER CENTER (the highest building in Romania), with 22 floors, built with 8m in length aluminium profiles, a novelty at that time for the Romanian painting market, and the list could continue.